General Motors Corporation, also known as GM, is a multinational corporation headquartered in the United States. The bus division started with the GM purchasing the interest in Yellow Coach. The Yellow Coach Manufacturing Co. was founded in 1923 as a subsidiary of the Yellow Cab Company by John D. Hertz and was an early player in bus manufacturing in the United States. G.J. Rackham, whose career had commenced with the London General Omnibus Company (LGOC) after the First World War spent four years in the USA from 1922 to 1926 and recognised the advantage of low swept chassis frame for bus development whilst employed by Yellow Coach in Chicago. It is likely that he was 'headhunted' by Hertz to help start up the bus building business. In 1926 he returned to England to join Leyland Motors as Chief Engineer and was responsible for the groundbreaking Titan and Tiger models. General Motors became a majority owner of the company in 1925 and changed the name to the Yellow Truck & Coach Manufacturing Company. In 1943 General Motors purchased the company outright and folded it into the GM Truck Division to form the GM Truck & Coach Division. Although GM continued with the Yellow Coach product line, the Yellow Coach badge gave way to the GM nameplate in 1944, and it manufactured transit and inter-urban buses in Canada and the United States until the 1980s. GM faced increased competition in the late 1970s and 1980s and stopped producing buses soon after. General Motors Diesel Division was once a unit of General Motors and manufactured products like locomotives, transit buses and military products. The GM "Old-Look" transit bus was introduced in 1940 by Yellow Coach. The initial production began with the model TG-3201 bus. Yellow Coach was an early bus builder that was partially owned by General Motors before being purchased in 1943 and folded into the GM Truck Division to develop the GM Truck & Coach Division. The Yellow Coach nameplate gave way to the GM nameplate in 1944. Production of most "old-look" models was discontinued upon the release of the GM New-Look bus in 1959; however some smaller "old-look" models continued to be produced until 1969. Approximately 38,000 "old-look" buses were built during the 29-year production run. The "old-look" name is an unofficial term that was applied to this series of GM buses after the release of the GM New-Look, with "New-Look" being an official term used by GM to describe their new line of buses that superseded the "old-look". The GM "old-look" bus was streamlined in appearance for its time and had windows that were generally smaller than those found on more modern bus designs produced after the 1950s. Unlike earlier buses, the GM "old-look" bus was built using a monocoque design, rather than a body-on-frame design, and it helped steer the change from gasoline to diesel-powered buses. Most "old-look" buses were powered with the Detroit Diesel 6-71 inline six-cylinder diesel engine, the exceptions being the shorter models that were powered by the four-cylinder version of the same diesel engine, and buses that were equipped with gasoline engines. Manual and automatic transmissions were available, with the Spicer angle-drive 2-speed transmission being used on automatic-equipped buses built prior to 1948. After 1948, the 2-speed Allison V-drive transmission was used on automatic-equipped buses. In 1940 and 1942, a small number of buses were built with electric propulsion systems instead of a transmission. The "old-look" was available in several lengths ranging from 25 to 41 1/2 feet, though the most common models were 35 and 40 feet long. 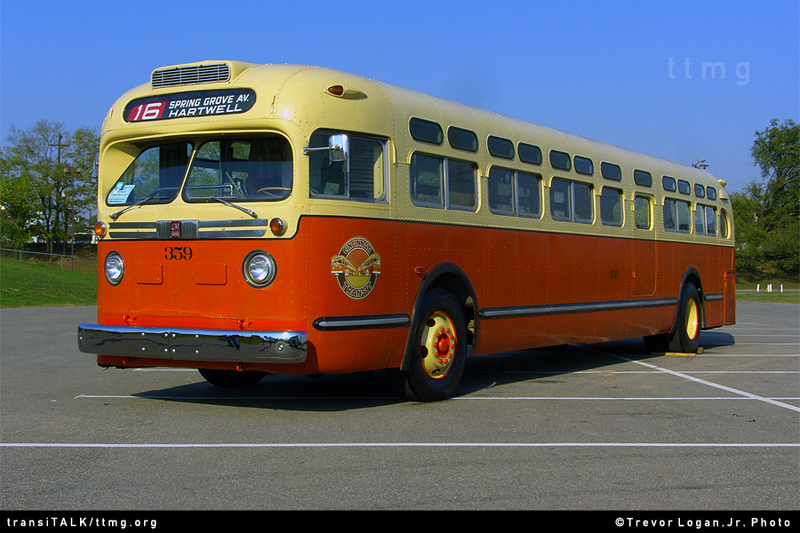 Most "old-look" buses were 96 inches wide, but 102-inch wide models were available beginning in 1948. In 1946 GM began offering its Thermo-matic heating and ventilation system, and in 1952 started making suburban models (buses with larger passenger windows, high-backed forward-facing seats, and optional luggage racks). Beginning in 1953, air-ride suspension became standard on all but the smallest model buses, and in 1958, air conditioning was added as an available option. In 1959, GM introduced its New-Look bus with the "fishbowl" style front window, and production stopped on all "old-look" buses other than the 28-foot models which were built until 1963 and the 30-foot models which were built until 1969. 35 01, 02-02A 30' The 02A Series featured Air-Conditioned Interiors and only 45 were Produced. 48 01 37¾' The 4801 Models were 102-Inches Wide. General Motors' New Look Bus was and remains one of the most popular and endearing of all the types they produced during their 60 + years of producing intercity and transit buses. The GM New Look (that was the official name used by GM to refer to them) was a radical departure in design from the buses that came before them (now generally referred to as Old Look buses). Between late 1959 and late 1977, some 26,000 were produced in Truck & Coach's Pontiac, Michigan plant. Production continued on the Canadian version in London, Ontario and St Eustache, Quebec for another eight years. The bus is easily identifiable by the well rounded and protruding six piece windshield, the fluted aluminum side panels and forward slanting large side windows. Many believe it was GM's finest hour in terms of design and engineering. The large windshield earned them the name "fishbowls", which is how most fans still refer to them. The majority of production was for 35 and 40 foot transit coaches featuring two doors. There was also a one door suburban version that incorporated underfloor luggage bays. Later in production a 30 foot model was introduced with a much lighter body and power pack, which was greeted with only limited success. There were four distinct design periods during the life of New Look construction. These "generations" were usually easy to tell apart by significant changes in design features. The first generation lasted from 1959 to 1962. These buses had square corner markers, raised belt rails and a distinctive rounded housing in the rear engine door for the various tail lights. The standee windows were longer, extending right to the markers, which created later body fatigue. Transmissions during this era "dip-shifted", automatically turning off power until the direct drive engaged. Models of the first generation included the 5301, 5302 (narrow version), 4516 (rare wide 35 footer) and 4517. Suburbans included the SDH(M) 5301 or 4501. The first two digits of the model number indicated the nominal maximum seating capacity. The second generation corrected some of the design defects, with standee windows that were shortened in the front to the leading edge of the first passenger window. The belt rail was flattened and the rear tail lights were now mounted to the aluminum skin of the rear engine compartment door. Corner markers returned to the rounded type familiar with the old look models. Transmissions made a significant change to the "power shift" type. This generation lasted from 1963 to 1967. New Look experts believe these were the most trouble free of the design. Models included 5303 (and narrow 5304) as well as the 35 foot 4518 and 4519. Suburbans were the 5302 and 4502. The third generation appeared in 1968 and lasted until 1972. They received the lighting package required by the Federal Motor Vehicle Safety Standards, which included Michigan Markers front and rear (they were optional before that) and side lights and markers halfway back on both sides. Corner marker design changed again to a smaller rounded unit. The most distinctive change from a spotting standpoint, beside the corner markers, was the change from gray to black rubber channel in the windows. The gray rubber had proven to deteriorate at an unacceptable level. Prior to this point, all engine choices had been 6V-71 with the VH transmission. With this generation, GM finally bowed to demand and made a V8 available in the 40 foot model (the 8V-71). Models included 5305/06 and 4521 (a wide 35 foot version was no longer offered). Suburbans included 5303 and 4503 models. With this generation, GM began indicating both the engine type (rather than just "D" for diesel) and whether the bus was air conditioned or not. The fourth generation began with 1973 production and lasted until the end of construction in the US, which was late 1976. The buses looked very much like the generation which proceeded it except for the two black enclosures surround the rear window, one of which housed a vertical exhaust stack and the other served as a fresh air intake for the engine. This was part of a so called Enviromental Improvement Package that actually was tested during the third generation, but became part of production with the fourth. Models included 5307/08 and 4523. For New Yorkers there was two more models, the famous 5309 and 5310. These were only produced for the NYCTA. New look production finally ended when GM was persuaded by a consortium of transit systems and some federal transit officials to upgrade to the RTS. 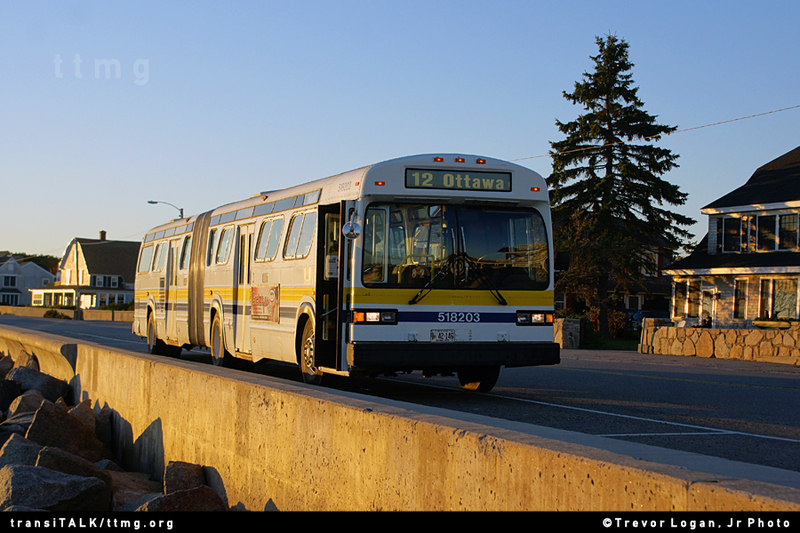 There was plenty of demand that remained for New Looks, including just about all Canadian transit systems. Production of the New Look continued in Canada until 1985, when it finally gave way to the Classic. Canadian production after 1977 featured the V-730 transmission and (after 1980) 6V-92 engines. Most of the New Looks that are still operating in Canada are from this era. In addition, several US transit properties bought significant orders of these Canadian-built New Looks. As with any bus model, there were lots of variations within production throughout the model's reign. The most prominent difference of interest was the suburban type buses that were actually built up deluxe transits (with no underfloor facilities). These went so far as to feature high back seats on platforms with luggage racks. Knowing what to spot was one of the fun facets of being a fan during the New Look era. It was an era of private enterprise among most transit operators, almost market dominance by GM and relatively few manufacturing regulations and alternative fuel concerns compared with today. It was also a time before low bid requirements reduced bus models and quality to the lowest common denominator. Because of all these things, the New Look lived in an era that won't be repeated. Those interested in further information about the GM New Look are encourage to acquire the book "Welcome Aboard the New Look Bus" by John H McKane and Gerald Squier, available on Amazon.com and at the New York Transit Museum book store. (Automatic) 45 01-04, 03A-04A 35' The Odd Numbered Series were 102" Wide while the Even Numbered Series were 96" Wide. The "A" Series featured Air-Conditioned Interiors and The "N" Series or No Suffix Letter featured Non Air-Conditioned Interiors. The Rapid Transit Series (RTS) bus is a long-running series of transit buses originally manufactured by General Motors. First produced in 1977, the RTS was GMC's entry into the Advanced Design Bus project and is the descendant of GMC's entry in the U.S. Department of Transportation's "Transbus" project. The RTS is notable for its futuristic (at the time) styling featuring automobile-like curved body and window panels. The RTS is the descendant of GMC's entry for the Transbus project which in turn was the descendant of the RTX, an experimental model for which a prototype produced in 1969 with notes of its production dating to early as 1964. 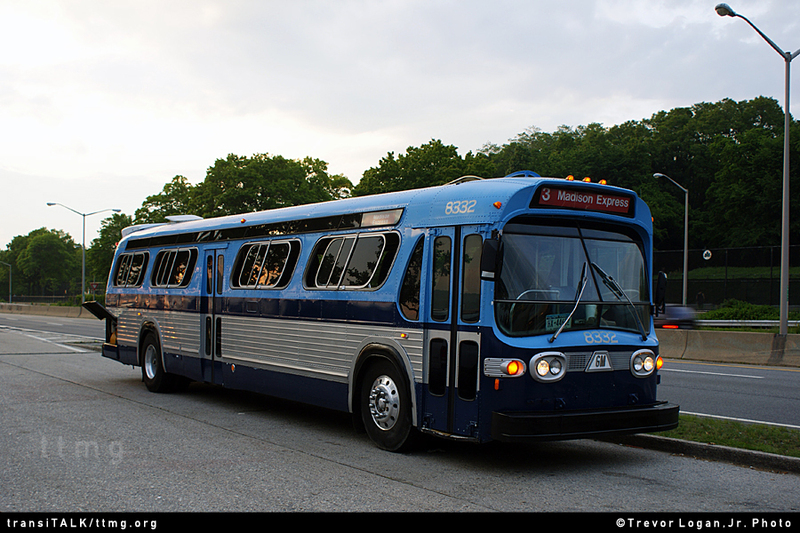 Both the RTX and the Transbus were similar in terms of design to the RTS though had major differences in having a less-rounded body design, a one-step entryway, and (in the case of the Transbus) a 45-foot length. Wanting a backup plan in the case that the Transbus project was abandoned, GMC decided to modify the RTX/Transbus design and in 1970 began the project that became the earliest RTS with the first prototype being assembled in 1973 at which point the project went onto hiatus. Though closer to its predecessors than the production models, the RTS name debuted with this prototype. After the project was revived in 1974, GMC would later withdraw from the Transbus project and focus their energies on the RTS. The RTS-01 (1977-1978), produced for a consortium of agencies in California, Massachusetts, and Texas, the RTS-01 was similar to the replacement RTS-03 only with some minor differences and a different style bumper. The RTS-03 (1978-1980) was the first mass-produced version of the RTS that gained popularity among transit authorities. The RTS-03 featured a modular design, which became the hallmark of the RTS; seamless, un-openable side windows; sliding ("plug") front and rear doors; and a distinctive, sloped rear module. The New York City Transit Authority ordered two RTS-03's as test vehicles, and sold one each to Green Bus Lines and Steinway Transit after they used the data learned to make changes in their order of RTS buses which became the RTS-04 model. Changes included improved Air Conditioning, which required a square rear end to provide for the larger hardware, tighter seals along the roof line and at the windows to prevent rain from entering the vehicle, larger windows, and push-out single panel rear doors. This last change was a carry-over from NYCTA's last two orders of Old Look buses, and has become standard on all buses they have ordered. The RTS-04 (1981-1986) was introduced in the early 1980s. The RTS-04 eliminated the sloped rear end in order to house an air conditioning unit. The RTS-04 also introduced more pronounced side windows that are similar to those featured in the latest RTS buses. These and previous models use independent front suspension. The RTS-05 was GMC's attempt to move the RTS to a T-drive configuration. Rear module structure was heavily modified for the 'straight-in' arrangement, and would later be used as the design source for the TMC RTS Series 07. 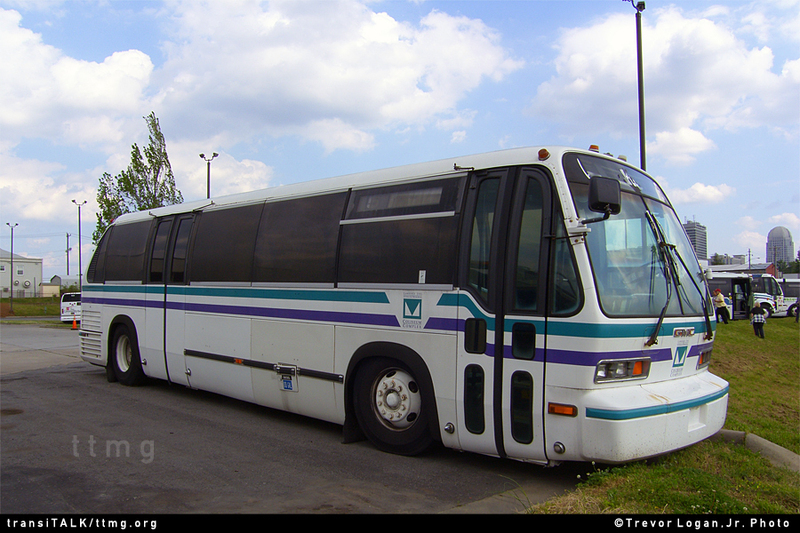 The RTS-06 (1986-1987) is the most common RTS found today and the only one made by three manufacturers (GMC, TMC, NovaBUS). The RTS-06 is extremely similar to the RTS-04, except for slightly different rear ends found in later models that house the Detroit Diesel Series 50 engine. The most obvious change eliminated the last window on each side. The front suspension for the -06 and later models was changed to a solid beam front axle. In 1980, GM also experimented with an Articulated-version of the RTS. At this time lots of US properties were catching onto the articulated "craze" that started over in Europe. By this time AM General and M*A*N had already entered the U.S. bus market from Europe and had a few orders operating in the U.S. However, many U.S. operators were crying for a "homegrown" model. GM, in a nutshell, teased the industry stating that it could make an articulated model but would not. The result? Four demo units that were made. One 55-foot model, two 60-foot models and one 65-foot model. But once again, GM never took on a full production order of the RTS Articulated and the program died in 1981. The TA60-102N, a 60-foot articulated version of the New Look manufactured by GMC in 1982, which had the body of a New Look but the front end of a Classic grafted on. This was actually GMC's way of testing the newly designed Classic style front end, but on a tried and tested body. The GMC Classic was a modern design of the popular GM New Look transit coach. 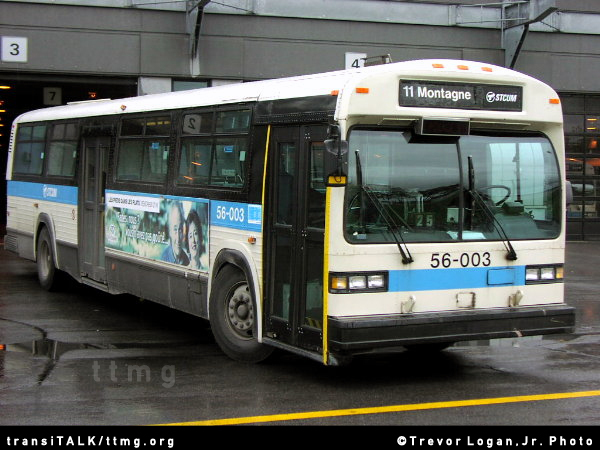 The Classic was produced from 1982 to 1997, and was a favorite among transit agencies in both Canada and the United States. When GMC in the United States decided to replace the New Look with the RTS series in 1977, they hoped that they would win over operators in both the US and Canada. But the design and the futuristic look turned off Canadian transit operators. So in 1979 GM Canada's Transit division decided to continue producing New Looks until 1982, when it unveiled the Classic. Several orders for New Looks were still accepted, built and delivered until 1986 for U.S. properties, although the buses were made in Canada. The buses proved to be a hit among not only operators in Canada, but in the United States, where the Utah Transit Authority would be the first US transit agency to buy the buses in 1984. In 1987, GMC sold the transit bus division to MCI and TMC which ceased the production of the Classic and also the RTS under the GM umbrella.